Evelyn turned out to have far more problems with her eyes than we ever imagined. During his examination yesterday morning, our veterinary ophthalmologist Dr. Yakely found Evelyn to have multiple eye conditions that precluded any surgery other than removal of both eyes. We knew Evelyn had cataracts and detached lens. Well, she also had detached retinas, glaucoma, a corneal ulcer, bullous keratitis, and a disorder called endothelial degeneration of the cornea, in which the cornea retains water. In short, her eyes were a disaster. Because of his findings, Dr. Yakely said there obviously would be no point in doing an electroretinogram to test her retinal functions. 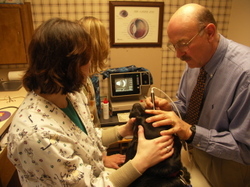 He decided to do an ultrasound of both eyes to confirm what he found in his visual examination. That's what you see Dr. Yakely doing in the photo above. 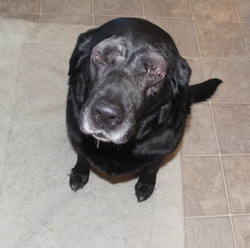 With this diagnosis, Dr. Yakely said our only option would be enucleation, i.e., to take both of her eyes out. I left Evelyn at the eye clinic for the surgery, and came back late in the afternoon to pick her up. She was still pretty zoned out but ready to be discharged. I carried this big (85 pounds!) sweet girl out of the clinic and laid her down in the back seat of the truck. And then we drove the 4 hours back to the ranch. Evelyn stirred only once or twice during the entire trip back. She was quite doped up on pain medication. But when we arrived at the ranch, I got out of the truck, walked into the house briefly, came back to the truck ... and found Evelyn sitting in the driver's seat. Again. I was too tired last night to post an update and so am doing it this morning. Evelyn is in my office with me, and I just took this photo of her. Despite how she looks, she's in good spirits and anxious for her breakfast. She's been trying to tell me, "Quit writing and start feeding!" Please give Evelyn a kiss from me. And keep us posted on her recovery. Thank you for taking such good care of her. Good girl, Evelyn! You're still in the driver's seat! So glad you're pain free now with your problem eyes taken out. If they don't work & they hurt, who needs them? We're so glad that you are up & at 'em. We're sending you big hugs for being such a sweetheart. Wow...she had quite a list of eye problems! I'm so glad her surgery was successful! She's a good girl; I hope she finally feels relief and continues to heal well. What a precious baby! Too funny to hear that the girl didn't forget her fave spot in the truck! Glad to hear she is in good spirits and won't be suffering. I just love how Evelyn managed to rally enough to grab the driver seat! What a sweetheart, I'm glad she won't be in pain from her eyes.